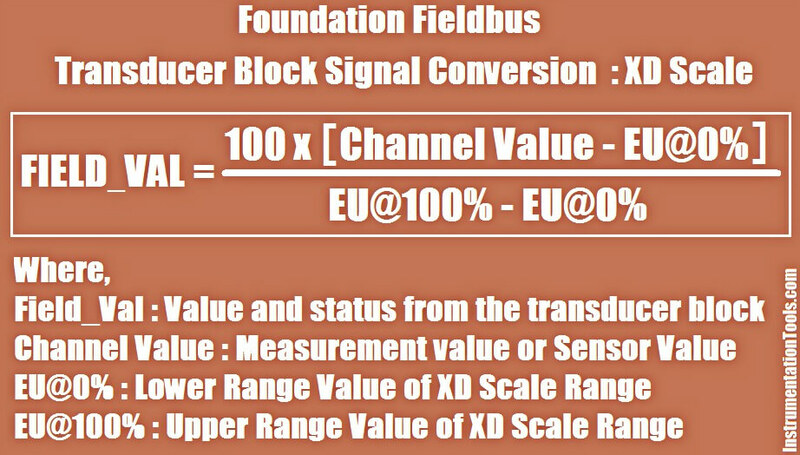 Every foundation fieldbus transmitters have mainly two types of scales or ranges. one is XD scale & second one is OUT Scale. Transducer scaling (XD_SCALE) is applied to the value from the channel (sensor measurement) to produce the FIELD_VAL in percent. The OUT_SCALE is normally the same as the transducer, but if L_TYPE is set to Indirect or Ind Sqr Root, OUT_SCALE determines the conversion from FIELD_VAL to the output. OUT_SCALE provides scaling for PV. The PV is always the value that the block will place in OUT if the mode is Auto. You can set the signal conversion type with the Linearization Type (L_TYPE) parameter. You can view the converted signal (in percent of XD_SCALE) through the FIELD_VAL parameter. Indirect signal conversion converts the signal linearly to the accessed channel input value (or the simulated value when simulation is enabled) from its specified range (XD_SCALE) to the range and units of the PV and OUT parameters (OUT_SCALE). Indirect Square Root signal conversion takes the square root of the value computed with the indirect signal conversion and scales it to the range and units of the PV and OUT parameters.